Transportation has gradually become a major industry in the modern world. Most food and chemical industries are now using tanks for easy storage and transport. ISO tank container transportation, in particular, has had a growing demand in the market over recent years. They are quite efficient in transporting bulk liquid than traditional drums. If you want to transport bulk liquid like wine, here is why you should consider using ISO tanks. ISO tanks are designed to withstand leakages during liquid storage and transportation. With the increased incidences of oil or chemical leakages, using ISO tanks is a favorable and environmentally friendly option. They minimize leakages and pollution to the environment. ISO tanks are also safe and suitable for the transportation of hazardous chemicals. Most industrial chemical transporters like ISO tanks due to their durability. An average ISO tank container can go up to 35 years in business. In economic terms, these tanks will save you a significant amount of invested capital in the long-run. If you are looking to stay in business for decades and you are looking for equipment that will last ages before disposal, it is advisable to use these tanks. In the event that you are no longer in need of the ISO tank, you can still sell it. The tank will have good resale value if you decide to dispose of it as second-hand equipment. ISO tanks are specially designed to allow for stacking as you would do with the ordinary box containers. During transportation or storage, you can place the ISO tanks on top of each other, unlike most drums, and economize on space. This feature helps you cut costs relating to transportation storage. ISO tanks are manufactured under strict standards and have to pass several quality tests before being released into the market. Before buying any ISO tank container, it is vital to confirm if the product conforms to all the set ISO standards. Quality inspectors must check the conditions of the valves and approve them before they are considered fit for sale. They are also required to have three quality closures. These closures ensure the stability of the container. All these features make even the second-hand ISO tanks good for resale as long as they sustain the pressure of holding the liquids. ISO tank transport allows for high-volume shipping and storage without the need for supporting packaging materials. This is another way in which the tanks save on cost. According to logistics experts, an ISO tank that is 20ft long can support an estimated 60 to 70% more liquid volume comfortably compared to stacking 20ft box containers with drums. If you are transporting liquid, it is advisable to use a vacuum pump package. The innovative tanks are specially designed with pre-installed steam coils that permit the users to load or discharge any liquids in a very efficient and safe manner despite their nature. Also, ISO tanks may hold up to six distinct compartments. They are ideal for transporting various products that need not mix all under one roof. Transporting products on the road exposes drivers to many uncertainties like adverse weather conditions, mechanical failures, and other road carnages. Although some circumstances are unavoidable, you are assured of product safety when they are transported in ISO tanks. Every container has a BIC code that helps track their routes and ensure that the tank and its components are safe. Also, most containers are hardy enough to withstand tough weather and unpredictable on-road conditions. 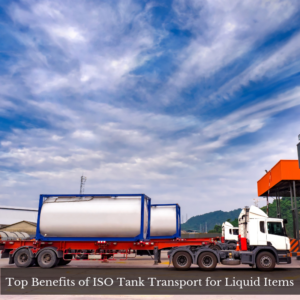 With all the benefits of ISO tank transport highlighted above, using these tanks will certainly help grow your business. Kan-Haul has been in the bulk liquid wine transport for the last 30 years. So, when deciding on who to choose for this important matter, make sure to contact us.